Start discussing Sunday night's and Tuesday's systems. Very moist system, that's apparent. Just don't know who gets snow and who doesn't, and I'm sure a system like this could present a surprise. Let's get everyone nailed this time! I’m just here to continue learning from you guys! The Dalles is getting hit pretty nicely. Seattle has gotten 10.6" this month, as of 9AM this morning. This makes February 2019 the snowiest February since 1949 when 13.1" was recorded. February 2019 is already the 2nd snowiest February on record since 1945.
future as a long wave trough dominates the synoptic pattern. Washington as another round of winter weather is expected. peeks of sun across the area, a welcomed sight after the storm. County will likely see wind chills just below zero. next 24 hours as details regarding this system become more clear. will continue through Sunday morning before next system approaches. Sunday into Sunday night will generally accumulate 1-3". will gradually ease late tonight into Sunday morning. of Juan De Fuca-Western Whatcom County. Western Skagit County-Western Whatcom County. Waters Including The San Juan Islands. Including The San Juan Islands. EURO seemed to trend in that direction! Good news, perhaps the wraparound band will make things fun later on. It’s upslope enhanced. These exiting lows are a great setups for the east slopes of the Cascades. The temp has already dropped back to 30 here. Going to be really cold tonight. Tim, you must inform this guy that Spring not only exists, it takes up half the year. For those that missed this from the other thread...latest Euro looks a lot more promising for Portland. 2/10 to 2/10 is just one day. There’s only room on this forum for one drunk uncle. Forecast to be in the low teens for me. It looks like it may have shifted the Mon/Tue system south a bit. Snow continues in McMinnville. Sitting at 32f. Approaching 1 inch. That's great, looks like the showers are intensifying a bit on radar. Washington County and Yamhill got pretty snubbed yesterday, you guys deserve the snow. It usually does. Just taking a break this month. Could it actually start trending south decently close to the event? this doesn't account for todays snowfall from this morning does it? 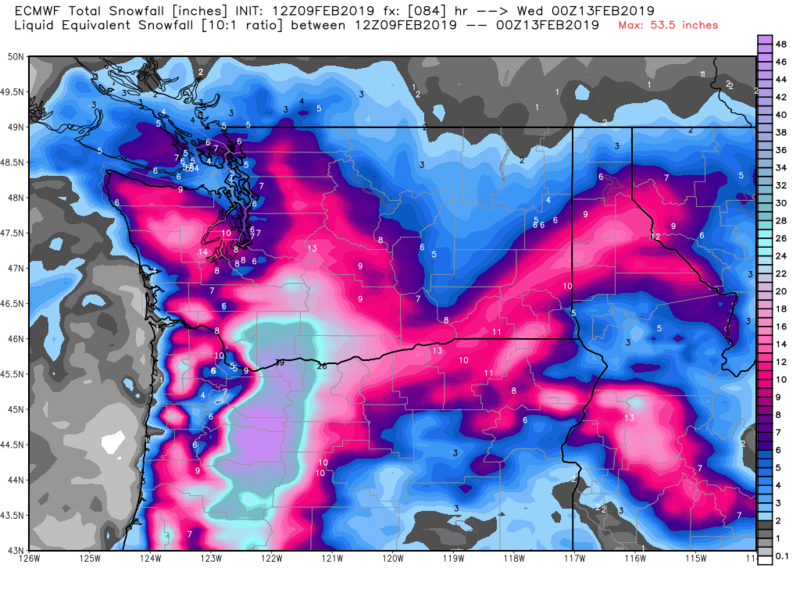 Even if snow doesn't fall in PDX Monday-Tuesday, the front and dynamics at play are very interesting and I wouldn't (in my amateur weather-fan knowledge) be surprised to see some areas in the PDX metro get a few inches. A non-event for points Battle Ground south. Mark just put the nail in it. He said maybe tr-1" before changing to rain. Lame. OMG, if Monday night's system goes south of PDX I am going to die!!!! Let's hope this southern move becomes a trend. The EURO's southerly move is very interesting, to say the least. Anyways, at the very least we can expect a dynamic storm with crazy foothill snow. Small bit of record keeping now that the Fraser outflow gradient is decreasing. Looks like it peaked at around -26mb this morning, which is right about where the forecasts were putting it earlier in the week. There's a 4-hour gap in the data, but by then pressure was already steadily rising at BLI. Its not going south of Portland. It might go north of Seattle. Does not really matter too much though up here at least... its cold on both sides of the low. Wow! Tons more snow for this area too. Anyone have any explanation of what changed here? The low simply further south? Photoshop? Doesn't seem very believable given all the model trends to the north. Incredible evening out there. Clear skies and deep snow cover giving everything a blueish cast. Looks cold! The increase in that snowfall map on the 18Z run could also be from the Monday system. Looks like BLI had a gust of 67 today. The start of the 18z Euro was from 10AM this morning. So it counts any snow that it thinks fell from 10 AM onward. Interesting. No obvious indication that it went that much further south on the 18z if at all except quite a bit more snow for PDX. It is a pretty map but it is impossible for such a large section of the PDX metro to get even half that amount with a south wind. I would discount the totals down here entirely except for select areas. This is 7-10 inches for PDX in the same sprint as last night being a widespread 3-5 inches (as per euro runs before yesterdays event). It will be lots of cold rain or non-sticking wet snow sadly. IMO the only way this can be different is if the low goes much further south. Yes, I think it went further south with that one. Could this be decent for the West Hills/Mt. Tabor/Coucil Crest/Chehalem Mountain (anywhere above 500 ft) even in the metro area? Maybe an inch or two of snow? Low is not going south of Portland. ECMWF showed that as well. The models have made the trends quite clear. Agree, it will not go south of Portland and that is why that 18z ECMWF snowmap will be completely wrong for here.